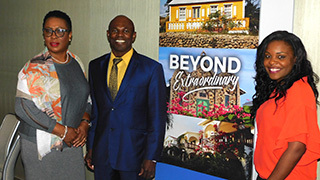 (L to R) Donna Banks, Anguilla Tourism Board chair, Parliamentary Secretary Cardigan Connor, Anguilla Tourism Board corporate affairs manager Shellya Rogers-Webster. It almost defies belief that a tiny island with a population of 14,000 was named #1 destination in the Caribbean, Bahamas and Bermuda by the readers of Travel + Leisure magazine – for two years running. But once you meet a few Anguillans, you get the feeling that anything is possible. Donna Banks, Chair of the Anguilla Tourist Board, offers one clue, stating that the island’s people “have a history of determination with just a hint of rebellion.” That determination has been evident many times during the island’s history, but perhaps never more so than over the past 16 months, as the island recovered from a hard hit by Hurricane Irma in September 2017. Visiting along with Banks was Cardigan Connor, a former cricket star who is now the Parliamentary Secretary for the government of Anguilla, with responsibility for tourism. Part of that vision includes improving access to the island. Currently, St. Maarten is the major gateway, with ferry and flight options. San Juan, Puerto Rico is another gateway, with easy flight options. 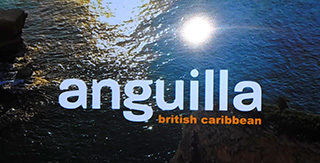 Both of those destinations were hit hard by September, 2017’s hurricanes, which has significantly hampered Anguilla access. That’s going to change in future. Anguilla has plans to extend the runway of the Clayton J. Lloyd International airport so that it will be able to welcome the 737 and A300 models often used by leisure airlines from North America. Despite the current lack of direct access, Canadians have continued travelling to Anguilla – and in larger numbers. We represent the 2nd-largest group of visitors to the island after the U.S.
Getting to Anguilla’s major gateways is no problem this winter, with Air Canada, WestJet, Sunwing and Air Transat all flying into St. Maarten and Air Canada, WestJet and Air Transat landing in Puerto Rico. Despite Anguilla’s diminutive size, there are a wide range of accommodation choices, and not all of them priced only for the very wealthy. 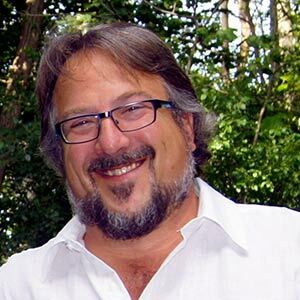 There are the familiar upscale names – Four Seasons Resort and Residences, Belmond Cap Juluca, Frangipani Beach Resort, Malliouhana, Auberge Resorts Collection and the CuisinArt Golf Resort and Spa.